Spending too much time in the Sun might result in a glowing tan, but the lasting effects on your skin, as seen under UV light, look less than attractive. The dangers of sun exposure are well-known, but skin cancer is still the most common form of cancer in the U.S. Still, the Vitamin D that we absorb from the Sun, in modest amounts, is good for us. This leaves us seeking a happy medium between burning to a crisp, applying globs of sunscreen, and charging up from our favorite star. Cosmetic giant L’Oreal is offering a solution to this predicament. You probably don’t think “technology” when you think L’Oreal. But this new innovation might change your perspective. My UV Patch is a wearable electronic that pairs with a mobile app. 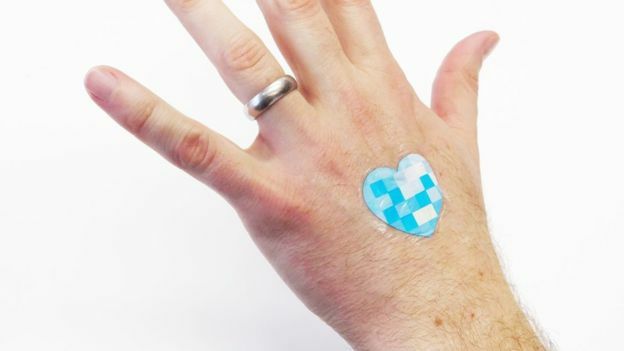 The patch monitors UV light exposure through a stretchable skin sensor. The patch is no thicker than a single strand of hair and measures just one square inch. Photosensitive dyes in the patch are able to detect changing skin colors when exposed to the UV rays. Using a smartphone, users can take a photo of the patch and upload it to a mobile app that will analyze the dye squares. The results will show how much UV exposure the wearer has received. In order to obtain the most accurate reading, the patch should be worn on the back of the hand for up to five days. It can then be disposed of, and a new patch can be applied. The wearer is still responsible for taking the app’s advice of how much is too much. In order to educate users, the app will offer Sun-safe behavior recommendations. For My UV Patch, L’Oreal worked with stretchable electronics maker MC10 and PCH, which engineered the product for mass production. L’Oreal believes this is the first example of a flexible wearable. Making the product in patch formed seemed obvious. The company’s tech team decided that we are all too bogged down with gadgets on our wrists (watches, wearable tech, fitness trackers) so a patch wouldn’t add to the load. The team didn’t want to create a product that would interfere with people’s daily activities. This is just the start of L’Oreal’s tech presence. The company has employed a 25-person research team, L’Oreal’s Technology Incubator. They were founded 2012 as a way to bring technology to beauty. The team has already created a mobile app called Makeup Genius, an augmented reality beauty app that allows consumers to “try” on makeup before buying it. Right now, My UV Patch in beta form. The product will be launched in 16 countries including the UK this summer, and will be available for free under L’Oreal’s dermatological skincare brand, La Roche-Posay.